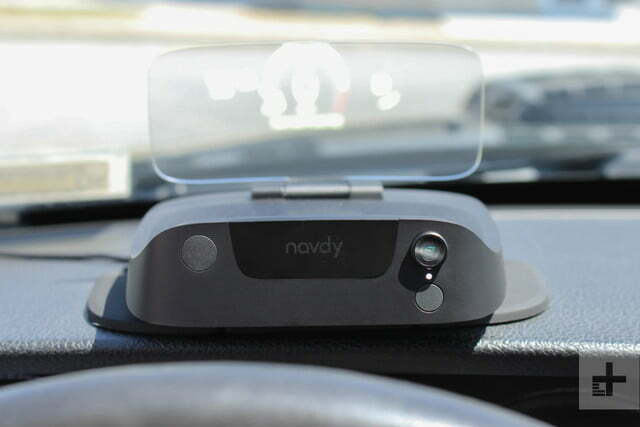 Navdy cuts the need for a litany of gadgets on your dash, making for a great all-in-one phone integration solution. Update: In late January, Navdy sent an email to customers stating that it’s no longer conducting business and is liquidating its assets. “What this means for you as a Navdy customer is that sometime within the next couple of weeks, your Navdy unit may stop functioning properly,” the note read. 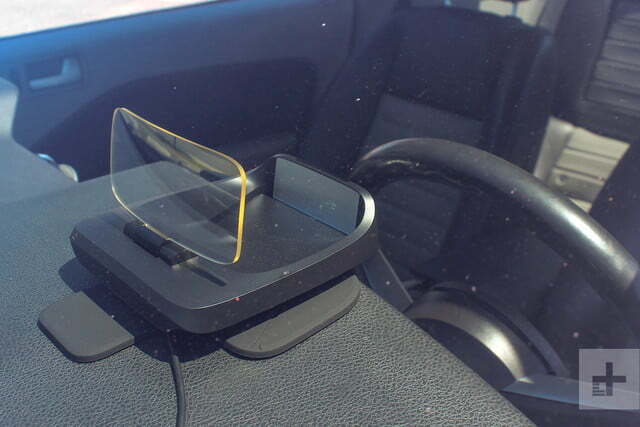 We suggest readers look elsewhere for a head-up display. Any number of new gadgets promise to modernize your older car, but frankly, a smartphone does a better job than most of them. That’s why the best car accessories now work in conjunction with mobile devices, rather than replacing them. But that still leaves one problem: You need to look at your phone as you drive. 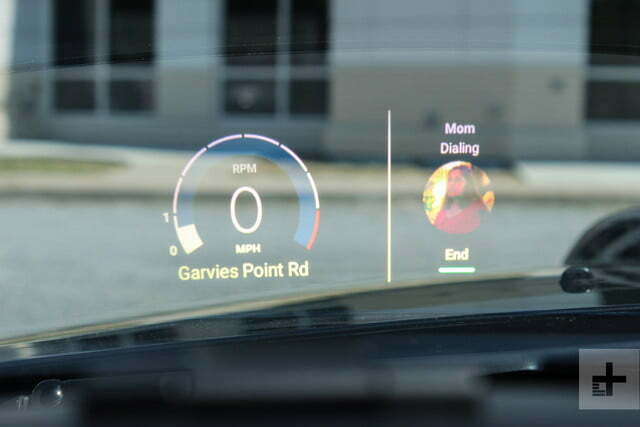 Enter Navdy, a head-up display unit that sits on top of your car’s dashboard and connects to both your car and your phone. 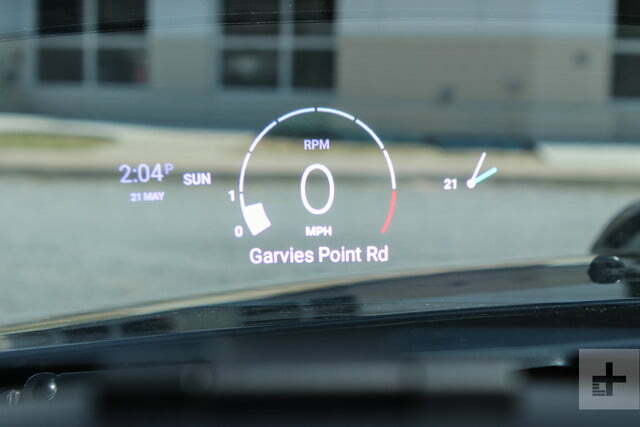 It shows the driver directions, phone contacts, text messages, and can even work as a virtual gauge cluster. All of this is displayed on a translucent screen that keeps the driver’s eyes fixed on the road ahead, not darting to the phone sitting in the cupholder. My 2008 Ford Mustang GT/CS has no navigation system, no backup camera or parking sensors, and no Bluetooth functionality of any kind. In other words, it’s a perfect candidate for the Navdy. Can the device smarten it up without distracting me? 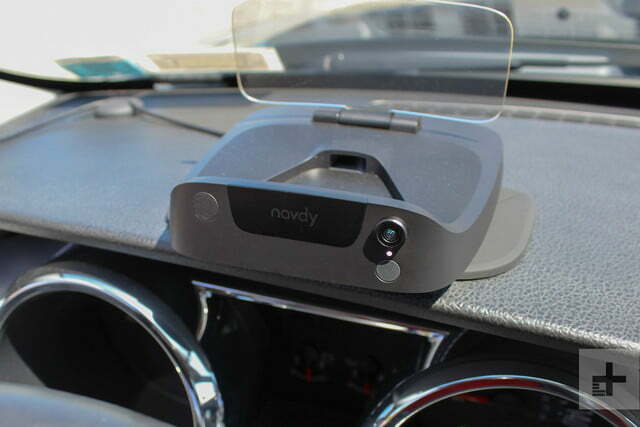 The Navdy is a sleek, black plastic device about the size of a sandwich, with a curved piece of clear plastic on top that serves as the display. On the front is an infrared LED, a power light, a power button and a camera-like gesture sensor. The box includes three different mounts (short, medium, and tall), a power cable, and a wireless dial that straps to your steering wheel for controlling the Navdy. Before the Navdy, I used to mount my phone to the side of my center console, which kept the phone out of my face, and the charging and aux cables out of the way. Since the car is a manual, it also lent itself to a sort of economy of movement – my hand was always nearby. For the most part, it worked: I could play music and flip through my selections without really having to look down, but glancing at maps required me to look away from the road. Also, any phone calls in my Bluetooth-less car turned into a shouting match, since the phone’s receiver is incredibly far away. 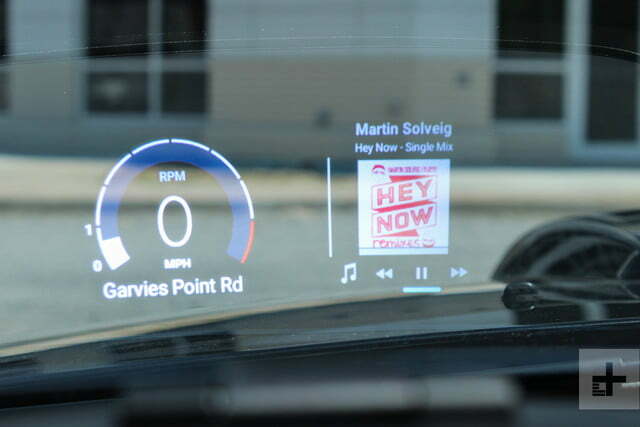 Navdy situates itself right on the dashboard, directly behind the steering wheel. 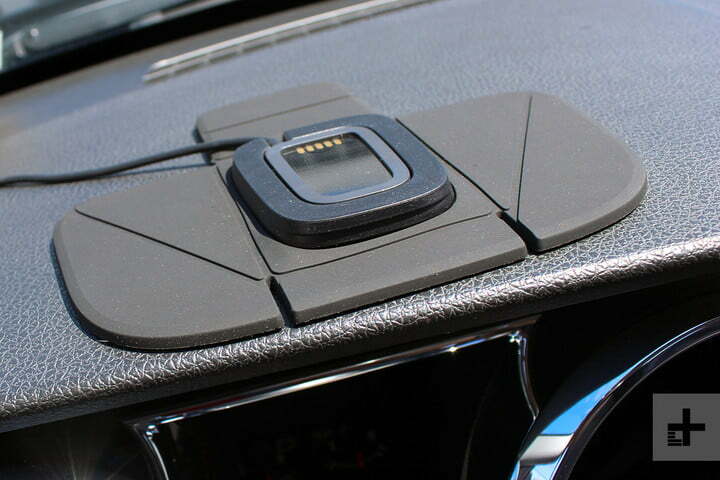 Its lone cable plugs into your car’s OBD II port, where it draws both power and data from your car. 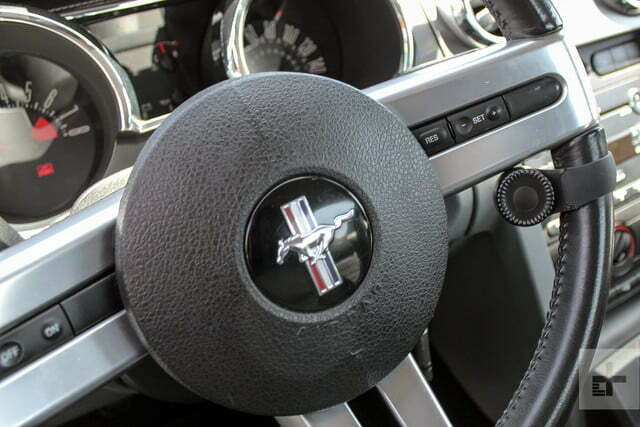 A small watch battery powers the steering wheel dial. Installation is easy, but it’s not something you want to rush through. Installation is easy, but it’s not something you want to rush through, particularly if using the short mount that I opted for. The sticky base of the rubber-mat-like mount is a pain to adjust once you’ve adhered it to the dash, so you want to nail the positioning the first time. After tucking the power cord neatly away, all that’s left is attaching the control dial, which wraps around whatever part of the steering wheel you prefer — I chose under the right spoke. It pulls tight across the meat of the wheel and stays where you leave it. With everything set up and the app installed on your phone, the Navdy pairs to your Android or iOS device with the Navdy app installed and awaits your command. 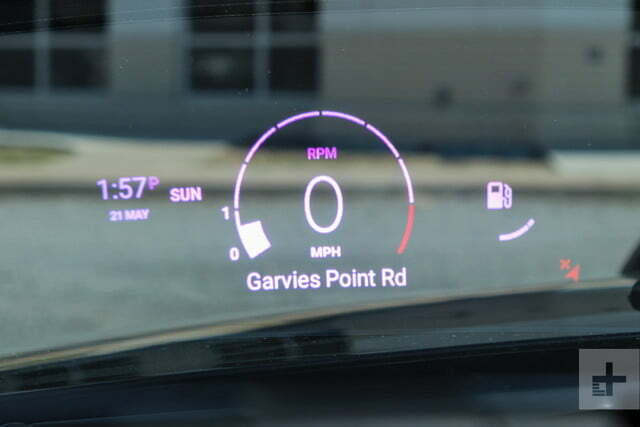 By default, the screen displays a virtual gauge cluster with your speed and RPM, which it reads through the OBD II connection. Bars on either side of the gauges can be configured to display info like direction, time, date, and your average mpg. A speedometer may seem redundant, but it’s nice to see how fast you’re going without glancing at the analog gauges. It displays the speed limit, too, which helpfully turns yellow if you creep more than 10 miles past it. Navigation requires Navdy’s app, but it’s Google powered, so you’ll get the same directions that Google Maps would issue. The display shows a deliberately simplified version of the map you would see on your phone, with bold white lines representing the road and blue lines prompting turns. It gives you a general sense of direction, but it’s not without its faults. For one, a low frame rate means choppy rotation of the map as you round a turn. It also makes judging the approach to turns difficult to gauge. Route guidance isn’t perfect, either. Often, the navigation couldn’t determine whether I was on the highway or on a service road parallel to it. Returning from a long drive on a traffic-heavy weekday, Navdy would suggest alternate routes, but those routes directed me to exit and re-enter the highway. It’s not clear if this is a fault with Google or Navdy, but either way, I ended up ignoring any prompts and dealt with the gridlock. 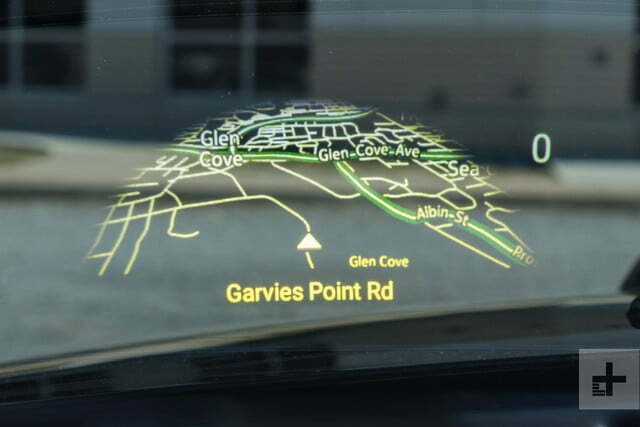 Displaying a gauge and directions in a head-up display isn’t a new trick, but Navdy does set itself apart in other ways. First off, the device allows you to receive a series of alerts from sources like Twitter, Outlook, and your text messages. Many of these notifications are collected in a menu called “glances” which is a list of prompts you can scroll through whenever you choose. You can even quickly dismiss all of them if you don’t want to look at them while driving. The need to monitor Twitter as you drive is debatable, and it doesn’t work out too well in practice anyway. The Navdy (thankfully) doesn’t display your Twitter feed, but in testing, even mentions or replies to tweets appeared sporadically, and what it did choose, it displayed as a shorthand URL. 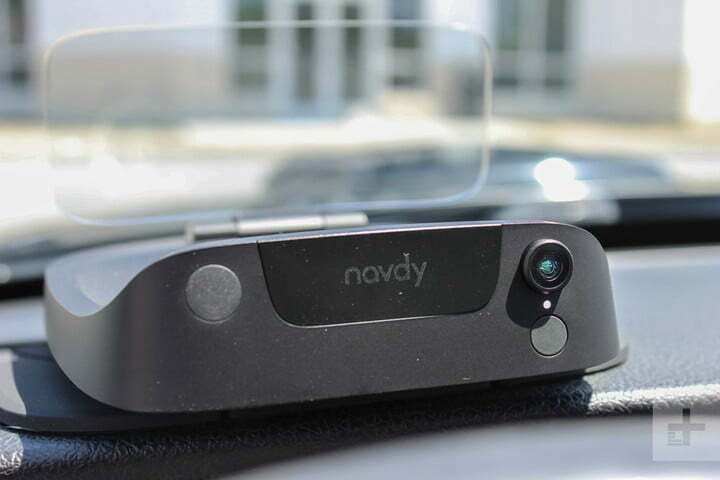 When you receive a text behind the wheel, the Navdy can (with a button press) read it out loud in a robotic voice, and simultaneously display it on the lens for you to quickly scan. I found myself quickly reading messages like “I’ll be there in five minutes” without being read aloud, and dismissing longer inconsequential messages to be read later. 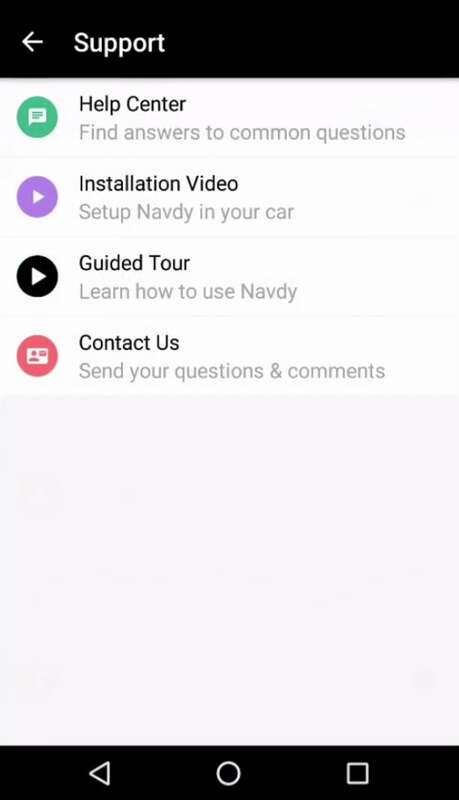 Navdy won’t prompt you to reply by text like Apple CarPlay, it will only allow you to close the message or call to the sender. If you want to reply by text, you’ll need to use Siri, which you can access through the steering wheel dial. No need to reach to your phone. 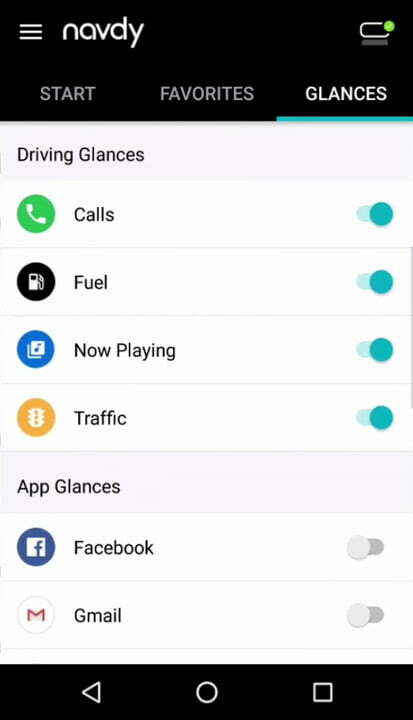 Navdy looks to help keep drivers connected, but to reduce the distractions that connectivity can bring. As a speakerphone upgrade, Navdy does an amazing job bringing old cars like mine into a modern age. The microphone’s directly behind the wheel and the audio plays through the car’s audio, making for easy conversations that don’t require too much shouting. Of course, you can ignore any of these notifications with a simple wave of a hand. 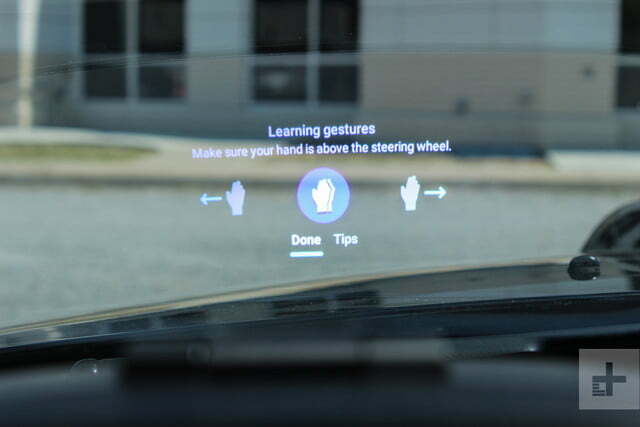 The gesture-recognition sensor on the front will recognize hand waves left or right that will command Navdy to display the message or dismiss it. It works, though it takes some getting used to, and not all notifications respond to the gestures. You can use it to impress friends and confuse the drivers around you, but you’ll more often just use the scroll wheel. At first, I was distracted by the new toy on my dash, staring at it just to see all the stuff it could do. But after a while, I got used to glancing down occasionally as intended, mostly to keep an eye on my speed. Sitting on full display on my dashboard, the Navdy made me slightly self-conscious. It drew stares from passengers in other cars, and I was afraid police would think it was a radar detector, or an unapproved display. When I parked, I popped the Navdy off its magnetic base and hid it away in the included microfiber bag, but it became tedious. Laziness won. It lives on my dash now, but I can’t help but think I’m inviting trouble. 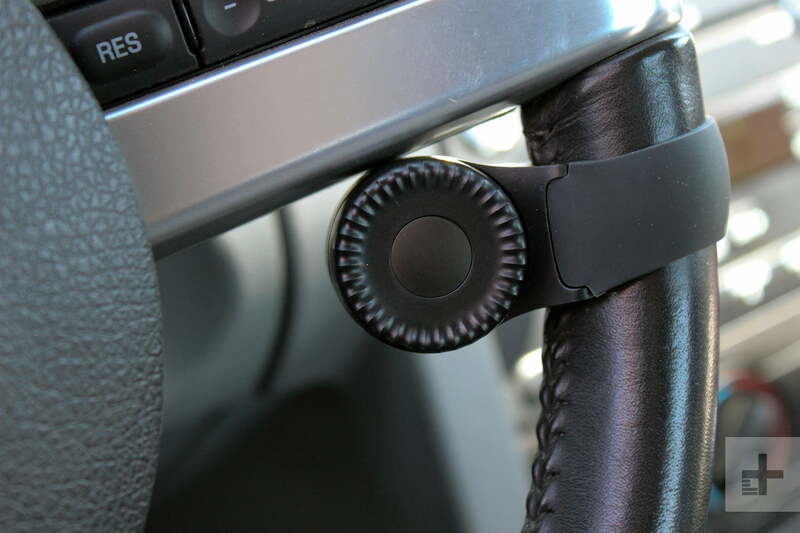 The wheel-mounted click wheel, though secure with its taught strap, still feels flimsy. 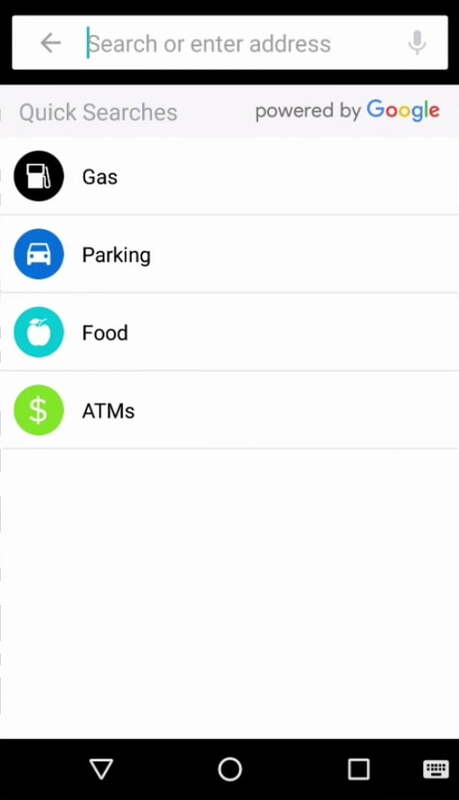 Since it’s essentially floating in the steering wheel’s negative space, you have to get a finger under it before clicking on the center input. It’s also very easy to scroll accidentally as you steer, and I’ve certainly knocked it off a couple times while parking. Many of the Navdy’s outlying kinks can be addressed by software updates, which are done through the phone. It stands to reason, too, that many of the gestures can be fine-tuned or even expanded, allowing other functions to be handled with a twirl of a finger. Did the Navdy launch my car into the future? No, but it certainly brought my car into the present. Some prompts may be more novelty than notification, but a safer way to make voice calls and check text messages is nearly worth the $499 asking price alone. Steep? Perhaps, but not an unreasonable price to ask for making a dumb car smart. Navdy may have some kinks to work out, but it packages the functions of many aftermarket accessories into one streamlined unit. Add a head-up display design that makes usage safe and easy, and Navdy becomes a smart buy for anyone looking to extend the life of an older, tech-free car. No. 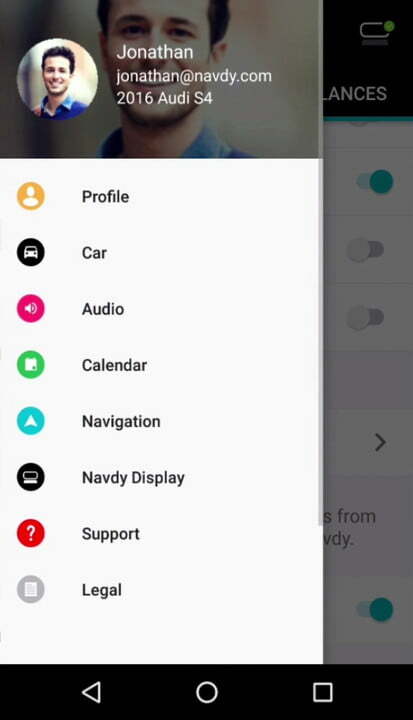 Some aftermarket devices like Hudway will mirror your phone’s screen, but these are low-level solutions compared to Navdy’s custom interface. 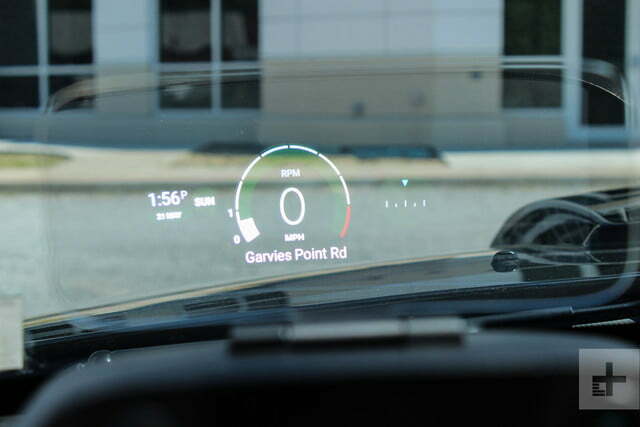 Even the built-in head-up displays on many luxury cars can’t match the level of information the Navdy offers. Probably not very long. 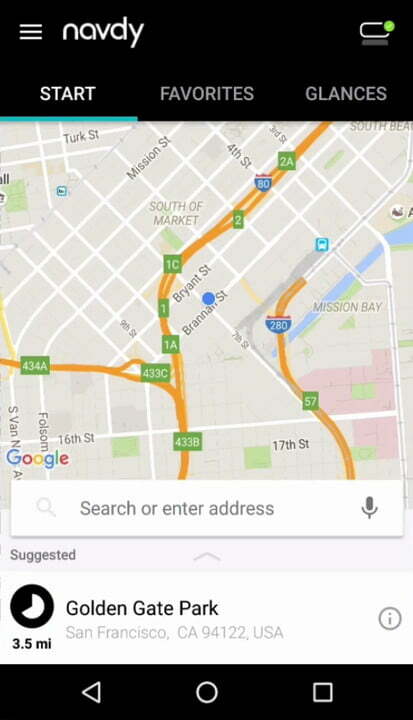 As long as you carry a smartphone on a daily basis, Navdy will be a great way to integrate it into your commute. Since Navdy the company is no longer doing business, it has emailed current users that their devices will likely fall out of use. The reason being functions like turn-by-turn navigation and voice recognition will no longer be supported, and that might cause the rest of the functions to stop working. This may change if someone buys up Navdy’s assets and decides to offer once again support the existing units, but there’s no way to say if that’s likely. No. While it was a handy upgrade for a car that’s lacking many modern conveniences, Navdy’s closed up shop. Without a company to offer updates or support any of its functions, if you have one or someone tries to sell one second-hand, you’re going to be stuck with a brick. Navdy was a great tool to do use your smartphone more safely and conveniently while driving, but as sad as we are to see this one fall out of use, we’re fortunate to have other options out there. Updated on 01-22-2018 by Alex Kalogianni: Updated to reflect that Navdy has gone out of business and is no longer a recommended product.